If you were to ever watch Rick Wearing & Sandra Parrott out on the ice curling, you’d clearly see just how strong their sense of partnership is. They’re naturally attuned with one another as husband & wife, and while their team doesn’t always win the game they play, Rick & Sandra always walk away feeling good about the way their team played. Both personally and professionally, this bond drives them to make the most of every opportunity together. Rick & Sandra are both longtime Huntsville residents. In fact, Sandra has lived in this area since she was 12 years old and is proud to share such a strong connection to this great community. Rick & Sandra have chosen to live here year round and love taking advantage of everything this area has to offer no matter the season. In addition to their favourite team sport of curling, when time permits Rick enjoys playing golf, working out at Fitt Gym and gardening. Sandra, a voracious reader on the other hand, can often be found devouring another book whenever she has the chance and has recently returned to Fitt Gym to resume her workout regime. 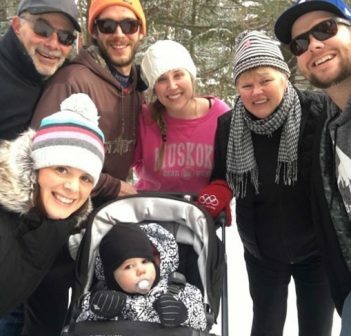 When not working with sellers and buyers, Rick & Sandra love to spend as much time as possible with their blended family of six children and their families – Michael Parrott & Theresa McNeilly, Lauren Parrott, Stephanie Parrott, Casey & Matt Cruise, Jamie & Rob Johnson, Drew Wearing & Kelly Armstrong. In addition, Rick & Sandra have been blessed with 5 grandchildren – Violet, Bodhi, Clara, Preston & Georgia. 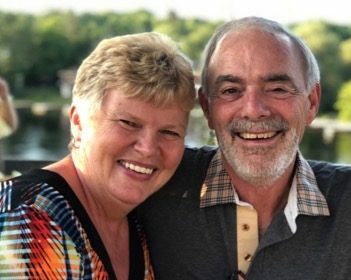 Rick & Sandra also take pleasure in spending time at their Huntsville home with Border Terriers Fergie & Piper and Shorty the cat, or with friends at the Huntsville Curling Club or on one of the local golf courses. Travel is an important aspect of Rick & Sandra’s life. Upcoming fall and winter getaways ideally will include Portugal/Spain, New Zealand/Australia and visits back to their respective ancestral roots in England and Ireland. Both Rick & Sandra feel community connections are important. They enjoy working with different Huntsville/Muskoka organizations to lend a helping hand. 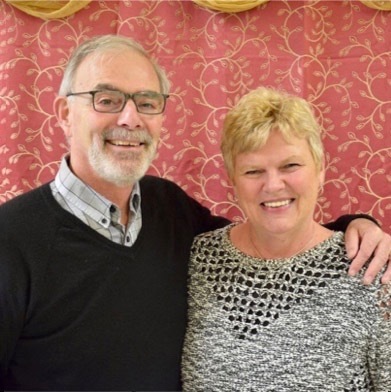 Rick & Sandra have partnered with and supported many local organizations, most recently The Table Soup Kitchen and Food Bank, where they serve monthly at the local soup kitchen; they are active members and partners with the Muskoka Community Church, The Door Your Centre, The Huntsville Curling Club, Rotary Theatrical Productions and The Huntsville Festival of the Arts. 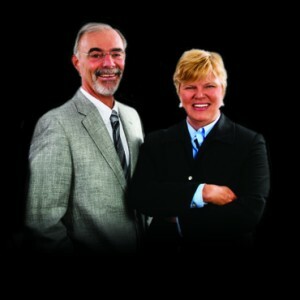 Rick & Sandra formed their real estate partnership 24 years ago in 1995. That real estate partnership has stood the test of time, as today Rick & Sandra are one of the most established and experienced real estate partnerships in the entire Muskoka region. Rick, a licensed Broker is also recognized as a Market Value Appraiser (MVA-Residential), and has attained certification with The Institute for Luxury Home Marketing as a Certified Luxury Home Marketing Specialist and is a member of the Million Dollar Guild, http://www.luxuryhomemarketing.com/real-estate-agents/. Locally Rick & Sandra are affiliated with Royal LePage Lakes of Muskoka Realty Inc., the largest brokerage with the greatest market share in the Muskoka Region. Rick & Sandra have consistently year over year throughout their entire careers, spanning a combined 61 years of real estate experience, been productive realtors partnering with and providing hundreds of Buyers and Sellers with award winning service. Most recently in 2018 Rick & Sandra attained the Royal LePage Diamond Award and Award of Excellence. Selling: partnering with Sellers in every aspect of the sale process to obtain the highest possible sale price in the most reasonable time frame with no hassles or complications along the way. Similarly, with Buyers: partnering in every aspect of the buying process to secure a home, cottage or condo in a preferred location with as many of the amenities / features desired by the buyer at a satisfactory price. Throughout the entire sale process from beginning to end, Rick & Sandra have developed partnerships with many local professionals who will assist their Seller and Buyer clients throughout their selling or buying experience. Examples of some of those professionals are: stagers, photographers, video & drone professionals, home inspectors, mortgage professionals, lawyers and any other professionals required throughout the sale / buying process, including after the completion of the sale or purchase. Contact Rick Wearing & Sandra Parrott Your Real Estate Partners! Whatever your Muskoka property dreams may be, let Rick & Sandra put their care and expertise to work for you. Please call them at 705-788-3535 or email at [email protected] today! This information is taken from sources deemed to be reliable. Rick Wearing and Sandra Parrott do not guarantee accuracy; we recommend information be validated independently. Rick Wearing & Sandra Parrott: The view is grand at Grandview! When you are ready to buy or sell your home, cottage or condo, you want Realtors whose expert advice you can trust and count on. Achieving your real estate dreams begins with an in-depth conversation about your wants and needs. Rick Wearing & Sandra Parrott not only provide over 61 years of combined real estate experience helping their clients, they believe in the power of listening too. You will be centre stage throughout the entire process. Contact Rick & Sandra to set up an obligation-free appointment, and find out how you can put this real estate partnership to work for you! Please call 705-788-3535 or email us at: [email protected] today!